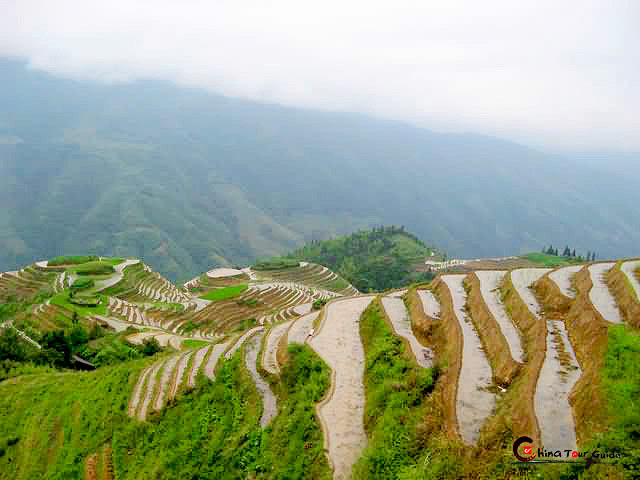 Guilin Liangjiang International Airport (KWL) is 28 km (17.39 mi) from the city center, and connects Guilin with most domestic cities as well as Japan, Singapore, Thailand, Korea, Macao, and Hong Kong. Flight times to major domestic and international cities are: Beijing - 2.5hrs; Qingdao - 4hrs; Chongqing - 1hr; Guangzhou - 1hr; Hangzhou - 2hrs; Shanghai - 2hrs; Hong Kong - 1hr; Shenzhen - 1hr; Bangkok - 2hrs; Macau - 1hr; Fukuoka - 5hrs; and Seoul - 4hrs. The airport shuttle bus runs between the airport and the Aviation Building located at 18 Shanghai Road at a cost of RMB 20. The bus departs the airport following flight arrivals, and leaves the city for the airport every 30 minutes between 6:30am and 8:00pm. The journey time is about 40 minutes. The taxi fare between the city and the airport is about RMB 80. 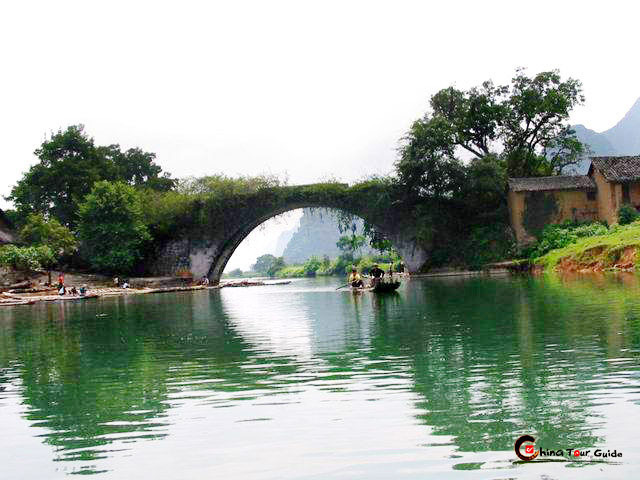 There are two railway stations in Guilin: Guilin Railway Station and Guilin North Railway Station. 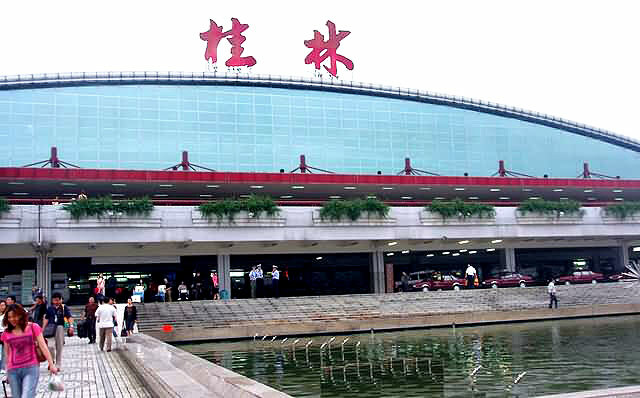 Guilin Railway Station (South Station) is south of the city center and more conveniently situated than the North Station. Rail journey times to major destinations are: Nanning - 6hrs; Liuzhou - 2.5hrs; Shenzhen - 13hrs; Beijing - 15hrs; Chengdu - 13hrs; Zhanjiang - 8hrs; and Shanghai - 10hrs. It is not easy to buy sleeper tickets at the Guilin sales office, as the city is a mid-route stop rather than a terminus. Therefore it is best to make reservations five days in advance or even 10 days prior to travel during holiday periods. The booking service fee is between RMB 20 and 50 per ticket. The fare on most public buses is RMB 1.2, with a 90 per cent discount for IC cards. The fare on number 98 and 99 buses is RMB 2, as they are air-conditioned. There are also eight free bus lines (numbers 51 to 58) which serve major tourist destinations. The buses operate from 7:00am to 7:00pm every day. This is a popular service, so the buses can get very crowded between 9 am and 5 pm. The taxi fare in Guilin depends on the vehicle type, is charged by distance and includes a per-journey oil price surcharge of RMB 1. The distance fare is RMB 7-8 for the first 2 kilometers, and RMB 1.4-1.6 per kilometer for the next 2 km, rising to RMB 2 per kilometer beyond that. This fare is significantly less than in major cities like Beijing or Shanghai. Rates are slightly higher between 11.00pm and 6.30am. Guilin's compact layout makes bicycle touring an attractive option. Bicycles can be rented by the hour or the day at most hotels and at other locations around the city, especially Zhongshan South Road. The daily rate is approximately RMB 15, with a deposit of RMB 100-300. 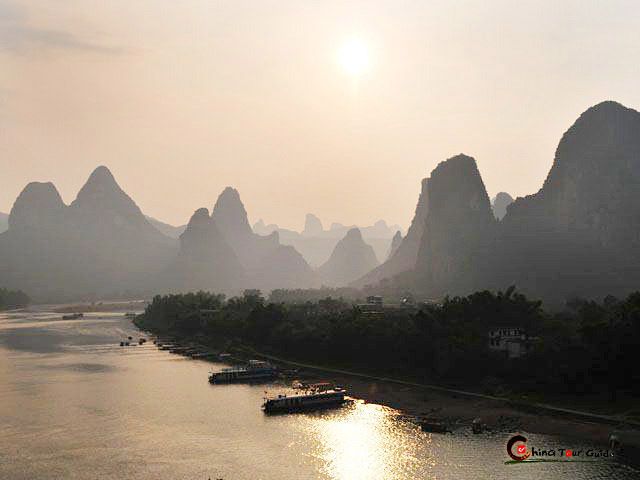 A trip on a cruise boat down the Li River to Yangshuo is a splendid way to enjoy the pleasant outdoors. Vessels depart in the morning and take about eight hours to complete the journey. Depending on seasonal water levels, the boats can either be boarded in the city center or further downstream at Mopanshan Wharf and Zhujiang Wharf. Zhujiang Wharf provides an English tour service.